Luxury abounds in this custom built tropical paradise that will astound even the most discriminate guest. The first thing that catches your eye is the breath-taking two-story wall of windows facing the converging waterways. Light floods the room. Beyond the sea of glass is an elongated heated pool and underwater bar. A gorgeous statue of 'tres serenas' stand tall at pool's edge. Beyond lies remarkable views of the Marco River waterways, dock and an over-water sunning deck. Outdoor Living: it's why you come to Marco Island!! Enjoy Marco Island’s balmy temperatures under Geranium's lanai and serve yourself at her stone summer kitchen and outdoor dining area. Geranium's Master suite is from a storybook. A huge, king, true four-poster bed speaks of fairy tale dreams. The Ionic posts are matched by columns of similar style framing the step-in marble Jacuzzi tub in the Master bath. Wrapped in granite, his and her vanities and a ladies' powder station come included. The shower thoughtfully includes a tiled bench for sitting while showering. Illuminated, double-tray ceiling loom overhead. In fact, double-tray illuminated ceilings are included throughout the house. You might have missed this detail when awed by the walls of glass and water. In which case, the elegant formal dining room with statuesque columns might have gone unnoticed as would the entrance to the private office/den just off the front entrance. There's an executive writing desk and chair. Computer printer and wi-fi router serving the entire house with high-speed cable internet access. The great room has double Bombay ceiling fans, supple leather sectional couch and easy service from the kitchen which opens to the great room over a granite conversation bar. The kitchen appliances are all top-end quality. One more thing you might have missed is the stairway to the second floor and the balconies around the great room. But before going upstairs check out the guest suite, with another pillow-top queen four poster. The adjoining bath includes an enclosed water closet. The high spot of the home, literally and figuratively, is the second floor. At the top of the stairs is a comfortable family and entertainment room. A comfy leather sofa, leather chair and ottoman provide seating for viewing the 52" Cable-driven Projection TV. The room also provide access to the secodn-story catwalk along the pool, and stunning water views. A second floor gallery also leads to two more guest rooms, each with its own balcony area and second-level views. One guest suite has a king four-poster bed and a 27" Cable driven flat screen TV. The third bedroom, also on the second floor, is furnished with two queen beds and details in the Key West style. In keeping with the no-expense-spared approach of Geranium, the third guest bedroom has independent climate control for the comfort of guest with separate temperature preferences. For southern style and privacy, all windows are fitted with plantation shutters at Geranium. Geranium is a stately property made available to public for rental only 20 weeks per year. Take advantage and be one of the lucky ones!! Wonderful, relaxing family vacation. Love Marco and Loved Geranium Ct. Geranium Court is beautiful and welcoming. It was just as we expected and more. The decor is upscale yet comfortable. We had an issue with the air conditioning but Marco Island Escapes rep was there within the half hour and it was fixed within the hour. Great customer service. Would most definitely return to Marco and this property. 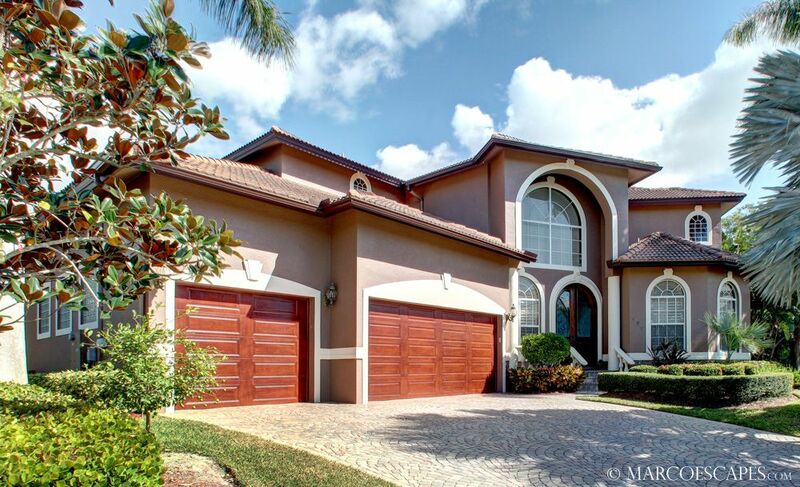 Simply a spectacular home in a great location on Marco Island! We had a very enjoyable vacation with a total of 6 adults in this large and nicely decorated property. The contacts at Marco Escapes did an excellent job with the coordination of the details for our stay. Would certainly enjoy an opportunity to come back again. Rented a boat for the week and enjoyed the water, with several trips up to Keewaydin Island and various mangrove coves for fishing. Also enjoyed a unique dining experience at the Snook Inn. Fantastic location, fantastic sumptuous property. Had the most relaxing holiday ever in the most comfortable house with spectacular views when we woke in the morning and before we closed out eyes at night. Look no further than Marco Escapes in Florida to make sure your vacation is extra special. Thank you for the kind words and thank you for taking such great care of our beloved Geranium! So glad to hear you all had a great time - that is always our goal, always what we work so hard for!! Look forward to seeing you again in 2015 my friends and have a fabulous summer in the UK!!! The Marco Escapes Hospitality Group! Rates from 2995 USD Per Week!